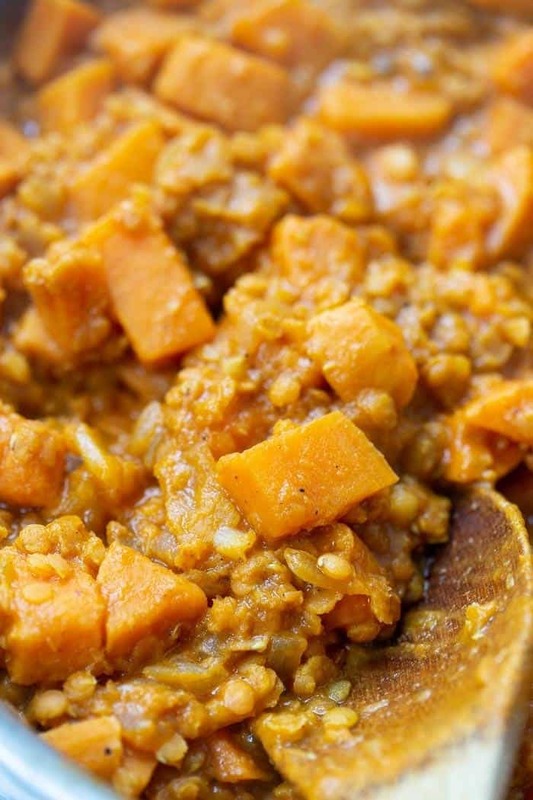 This creamy Red Lentil Curry uses sweet potatoes, coconut milk and just 9 other ingredients! Made in just one pot, it's also vegan, gluten-free and healthy! It's soup/stew/curry season and I'm pumped! I personally love ending a long, hard day with something cozy and comforting. 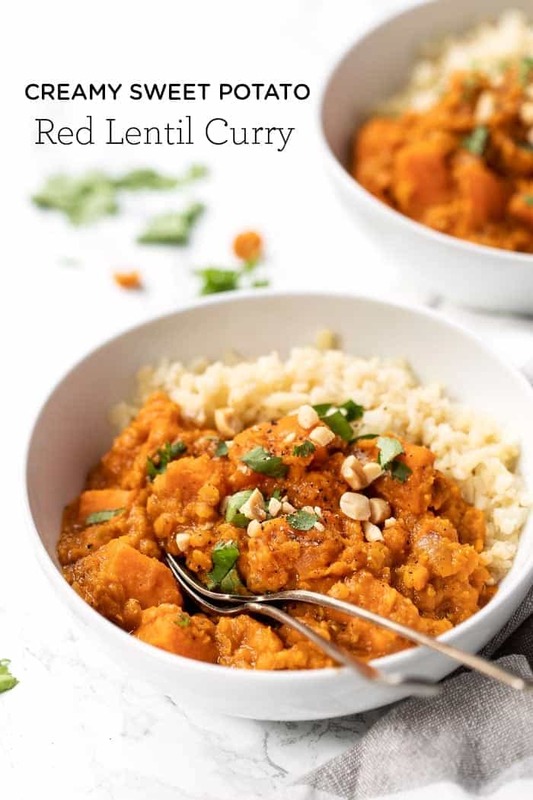 And this red lentil curry does just the trick. It's easy to make, it's got an ultra thick, creamy texture and has just the right amount of spice. 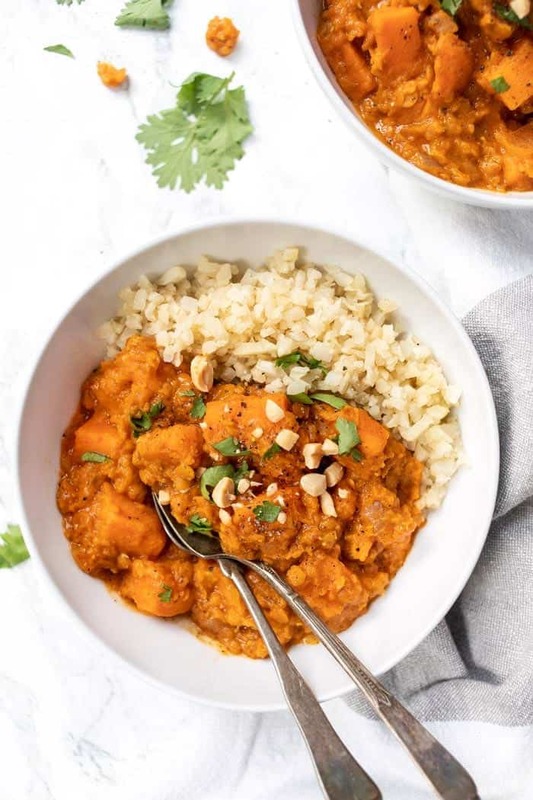 We're using hearty sweet potatoes with high-protein, creamy red lentils for what I think might just be the ultimate vegan red curry! There are three main types of lentils: green, brown and red. All three are high in protein and fiber, are semi-quick to cook (in bean land at least) and are easy to incorporate into many dishes. They're probably also one of the most common legumes consumed across the world. Red lentils are the sweetest and also the fastest cooking. In general, they should take about 15 – 25 minutes to cook. One thing to keep in mind with red lentils is that they don't hold their shape like other lentils do and tend to get mushy when cooked. This makes them perfect for things like red lentil dahl, but also for thickening soups and stews. And that's exactly how we're using them in this red lentil curry: to thicken and to add protein! Fundamentally, curries are pretty easy to make and can be customized to your heart's content. There are hundreds (if not thousands) of variations out there and they can be flavored in all sorts of ways. Curry is also a classic dish in many cuisines including Indian, Thai, Middle Eastern, Korean, Chinese, Nepalese, etc. And each will have their own flavor twist. For today's recipe, we're using Thai red curry paste to elevate the flavor of this vegan red curry without having to source strange(ish) ingredients. It's actually recommended that you go with store-bought curry pastes because their flavors are good and to make it at home can be quite challenging. And then whatever vegetables you want to add! We're keeping things as simple as possible with this recipe. It's made in just one pot and uses just 11 ingredients. It's also ready in about 40 minutes, most of which is hands-off cooking. 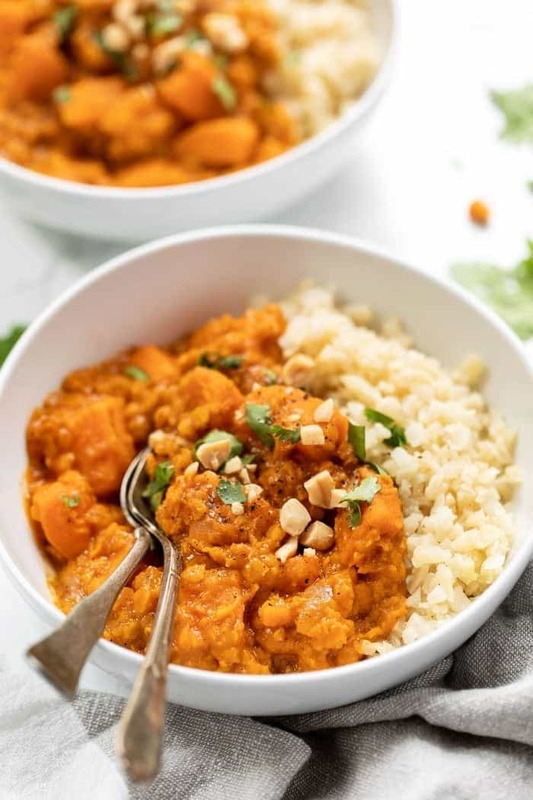 Sweet potatoes are there to help bulk up the curry, lentils to add protein and texture, coconut milk to give it that nice richness, ginger and garlic for a little kick, tomato to round out the sweetness and elevate the flavor of the curry paste. And just a touch of broth to get everything cooking! So I'd say it's pretty much the ultimate weeknight meal. 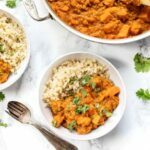 Bonus points… this curry can also be used as a meal prep meal, be frozen and I think you could also make it in the slow cooker! 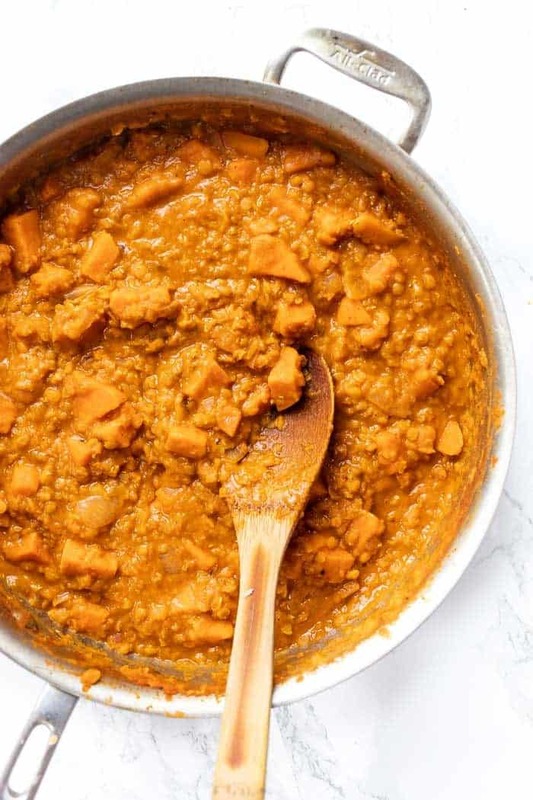 This creamy sweet potato and red lentil curry takes around 30 minutes to cook and is the perfect cozy recipe! It's vegan, gluten-free and super flavorful! Heat the oil in a large skillet or dutch oven. Add the onions and cook for 2 - 3 minutes, stirring often. Add the ginger, garlic and curry powder and cook for another minute. Once the mixture is starting to be fragrant, add the tomato and red curry pastes. Stir everything together until combined. Stir in sweet potato and lentils and cook for another 30 seconds before adding the coconut milk. Bring this mixture to a boil then cover and simmer for 15 minutes. Remove the lid and stir in vegetable broth, then season with salt and pepper. Cover again and cook for another 15 minutes. Serve warm with rice, quinoa, cauliflower rice, etc., as well as some cilantro. I also love serving this with a side of sauteed spinach or kale! I made it last night and it was delicious. Thank you for all your great healthy recipies. The red curry paste has shrimp paste in it. Should this dish still be considered vegan? Hi, I made this today, it’s absolutely delicious and very quick and so easy to make. I used beluga lentils with sweet potatoes as they are the only ones I had and it worked out great. Thank you!!! I have been watching and following your recipes for a while, but this is the first I’ve tried making and it is really delicious. I swapped the sweet potatoes for left-over roasted squash though and left out the curry powder, because my digestion appears to be very sensitive to it. Loved the outcome anyways. Thank you for sharing this. I truly appreciate all the hard work you are putting into your channel and your blog. Keep up the good work. I am looking forward to trying many more recipes of yours. YAY! I’m so so glad you enjoyed it, Sadie 🙂 And yum with the squash, SO good! My daughter-in-law made this and I enjoyed it so much. So I am now trying to make the recipe. My only comment at this point is that you talk way too fast on your you tube video…….difficult for me to keep up. SO good! Tastes like restaurant quality Indian food. Omg this is so delicious! Super easy and perfect for meal prep! I’m so happy I found your site! Yay! So happy to have you here 🙂 If you have a minute to leave a star rating, I would so appreciate it! Amazing! Even my husband loved it! I didn’t have fresh ginger so subbed ginger powder. Still, this was absolutely delicious. I served mine over steamed riced cauliflower and my husband had his over pork. The flavors are spot on…my new fav curry recipe. Thanks! Oh I’m SO glad!! Thank you Maureen 🙂 Glad you both enjoyed it too! Delicious! I used Trader Joe’s reduced fat coconut milk. This is a keeper!